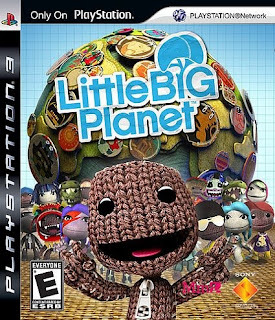 In October of 08 a game came out for the PS3 called Little Big Planet. It was a platformer that gave you a giant toolbox to create your own levels. Considering I only have a 360, I was very jealous of the game. I wanted to build levels too. Eventually I managed to suppress that desire enough to go about my day to day activities. 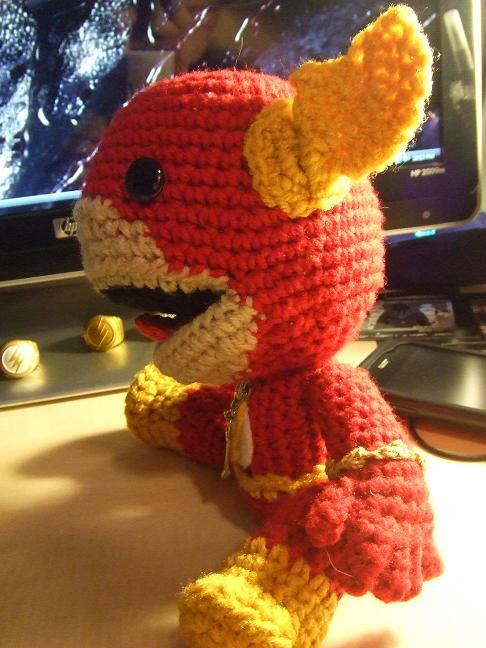 Then I saw that my friend Maggie had begun crocheting Sackboys. By the way, I don’t think I’ve ever seen the word crochet in print before; my god does that look dirty. So, anyway Maggie is making these incredibly cute Sackboys. 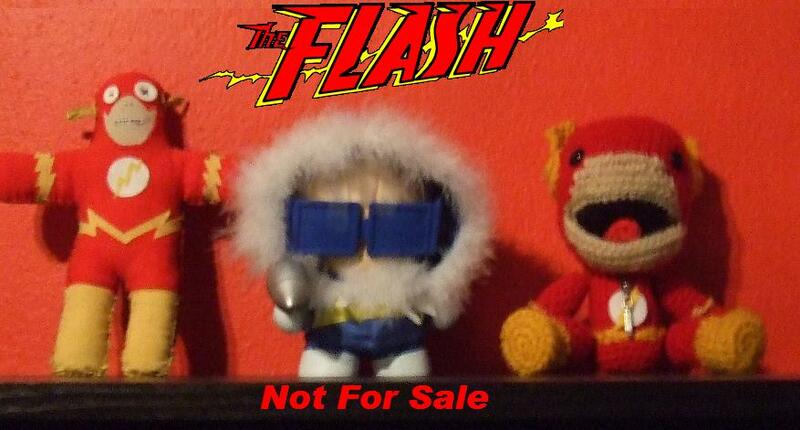 And I was lucky enough to get one decked out as the Flash for my Birthday last year. This little guy is amazing. The eyes and the open mouth give him a muppet-like quality that I love. 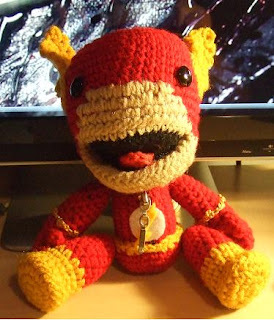 He is rocking the straight belt, so he looks like he is tiny Barry Allen. Here is an up close shot of the chest. You can see he has a real metal zipper. 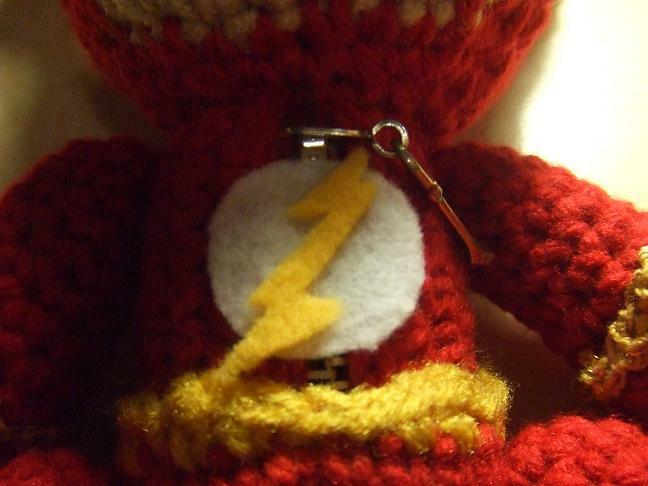 The little Flash symbol covers up part of the zipper, but here you can see that it does go down the chest. It’s ok that it gets covered though because the little felt logo looks great. One of the cutest things about this little guy is his ear wings are crocheted too. This picture also shows that his tongue isn’t just a bit of red in the mouth; it actually sticks out a little bit. You can also see a bit of the gold that is strung through the yellow areas on his arms and belt. They don’t pick up too well in the photos unfortunately. Hopefully you’ve enjoyed a little look into my NFS collection. 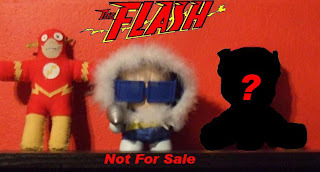 Next week I’ll have some other kind of Flash topic to talk about, hope to see you then.